The best way to find questions to answer is to use your Dashboard! Your Dashboard is the 'homepage' of Socratic for all logged in users, and you can get there by clicking on the Socratic owl and logo in the top left corner of the page. Below the blue area at the top, you'll see a list of questions on the left hand side and filters on the right hand side. The default setting shows you questions sorted by recency. Here, you can choose to see only unanswered questions. "Answers that need help" shows you a list of questions that are answered but whose answers have been identified as needing improvement. 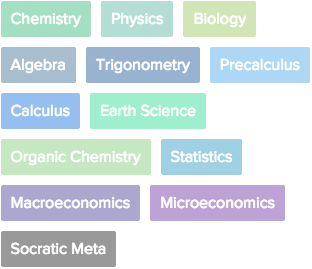 These filters divide all questions into two categories: questions where you can solve a specific problem (Practice problems), and questions where you can explain a concept (Conceptual questions). The first category is great for applying knowledge. The ever growing subjects list can be used to filter down to just one subject at a time. Use the preferences above it if you'd like to permanently change what questions you see in your Dashboard!